Deep down, we are all foragers. Experts estimate that at least 90% of human history has been fueled by hunting and gathering, so this stuff is in our DNA. Why not give it a try? It’s wild and free. Reclaim a relationship with nature. Unplug, open up to the natural world, use your senses, and feel alive. This has been my first Summer in Seattle, and it has been GLORIOUS. 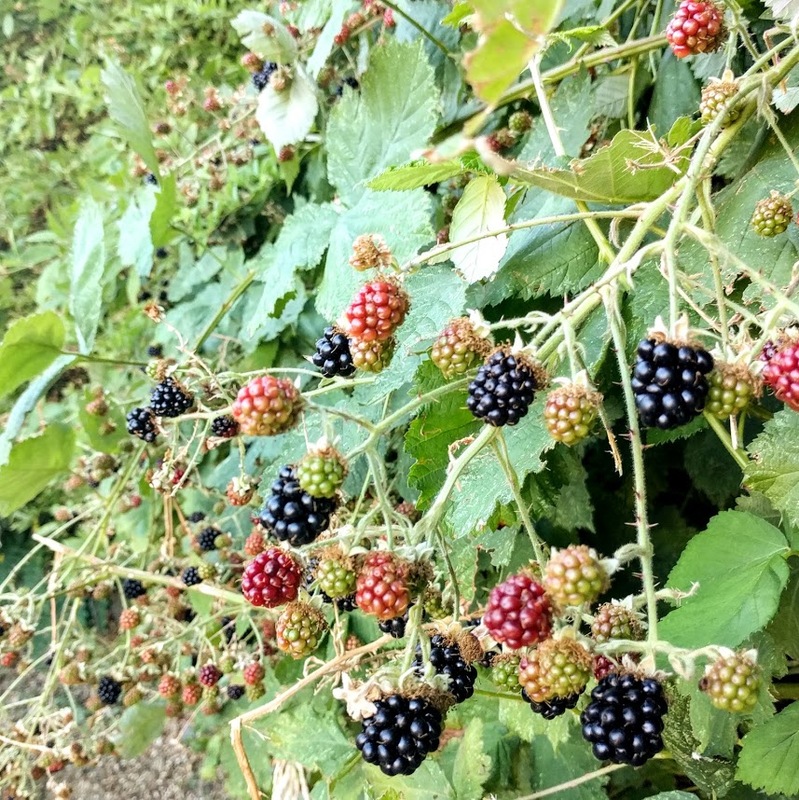 The days are long (crazy late sunsets), the sun is out (we had 55 days in a row with no rain – literally the longest sunny streak in the history of Seattle), and, oh right, there are also infinite free blackberries. 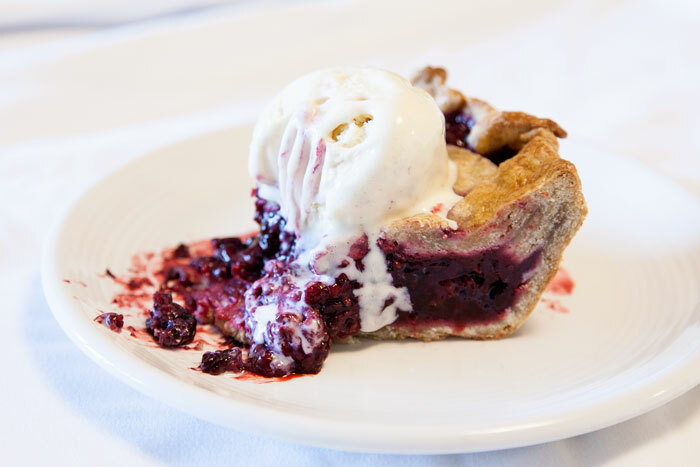 It feels only natural to celebrate with PIE. I hadn’t made a fruit pie in years, but I have to say it made for some real feel-good weekend leisure baking. Months ago, I pinned a recipe for sourdough pate brisee (!!!) from The Bojon Gourmet that has been haunting my dreams ever since. Obviously this was the perfect moment to make it happen – what better pairing for wild blackberries than wild yeast?? The sourdough starter doesn’t rise the dough, but it adds flavor and its acidity has a tenderizing effect (the same reason why many pie recipes call for vinegar). After chilling the dough overnight, I rolled it out, tucked half into my favorite pyrex, sliced the other half into random widths, and took a gleeful winging-it approach to weaving it around the simplest wildest filling. I was in love with the sourdough pastry – soft, grainy, flaky, buttery, with a signature cultured complexity. The wild blackberry filling, of course, was unreal. Wild foods tend to be more intensely flavored (and often more potently nutritious) than their cultivated counterparts. They are worth the trip outside! If your world has berries to give you, get out there while you can. 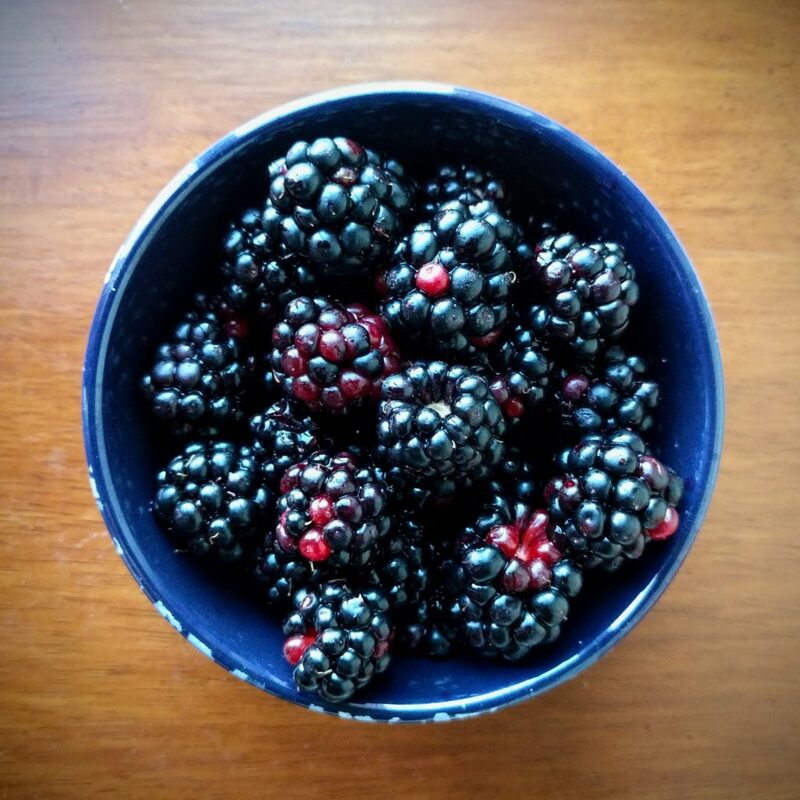 Summer is fleeting, and so is blackberry season, and so is life, and so is pie. That’s what makes these moments so sweet. Combine the flours, salt and sugar in a large bowl. Cut the cold butter into chunks and toss with the flour mixture. Work with your hands to break the butter down into the dough, rubbing larger chunks between your fingers until you create a texture of flattened flakes with gravelly pea-sized clumps. Ensure your sourdough starter is a liquid consistency (no thicker than pancake batter; add water if needed) and gently stir it into the pastry mixture until just combined. Transfer the dough to a floured surface, and attempt a fraisage method for extra flakiness if desired*: grab a handful of dough at a time and use the heel of your hand to scrape it against the floured work surface. Stack each flattened leaf of dough into a slab, divide into two equal pieces, and shape into two round disks. Wrap each in plastic and chill in the refrigerator for at least 30 minutes, or up to a few days. When you are ready to assemble the pie, preheat the oven to 425 F. Unwrap the dough and return to a floured surface. Gently and evenly roll out the first disk until it is large enough to place into an ungreased 9-inch pie pan with about 1 inch of overhang. Roll the second disk out into another large circle for the lid. Let both crusts chill in the refrigerator while you prepare the blackberry filling. Wash the berries and drain off any excess liquid. In a large bowl, toss the berries with the sugar, cornstarch, lemon juice and salt. Pour the blackberry filling into the unbaked crust in the pan. Place the top crust: either lay the full round on top (cutting 8 slits surrounding the center), or first slice it into strips and weave into a lattice as desired. In either case, crimp the edges of the top layer together with the bottom crust. Brush the top crust with a wash of either cream or beaten egg, and sprinkle lightly with sugar. Place the pie pan on a rimmed baking sheet and transfer to the middle rack of the oven. Bake for 20 minutes at 425 F before lowering the temperature to 350 F and baking for 35-45 minutes longer, until the filling is bubbling. Watch the crust carefully; when it bakes to a golden brown, cover the top with aluminum foil to prevent further darkening. 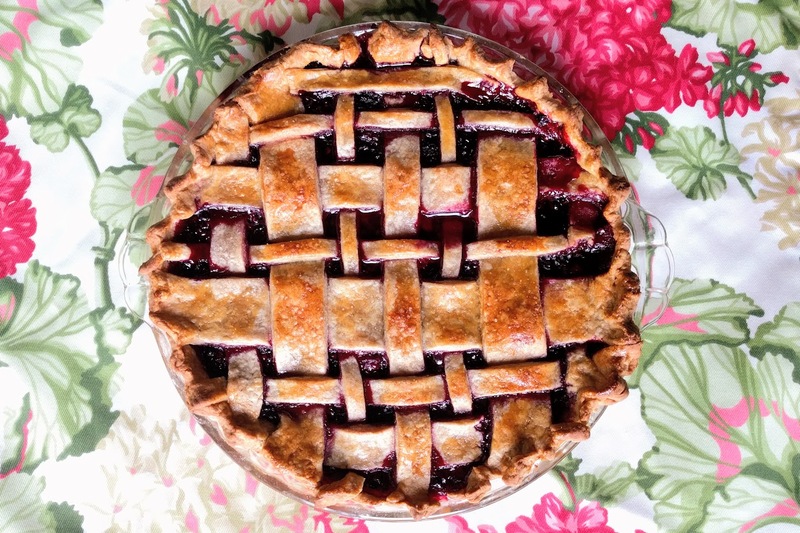 After baking, place the pie on a rack and allow to cool completely (at least 2 hours) before slicing.